Foetal Heart Monitor ( Infant Care Equipment ,Foetal Heart Doppler ) - Perfect designing and ease of operations ensure that these equipment give hassle free performance. Complete safety and surety is ensured in our infant care equipment so that proper care can be given to the new born baby. 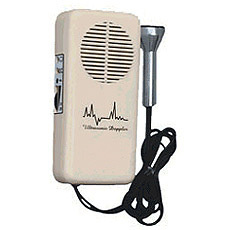 Foetal Heart Monitor ( Infant Care Equipment , Foetal Heart Doppler ) - portable and handy with carry bag -Frequency 2 MHz, Power Supply Battery of 9 volts. Works on Mains 220 volts. - Facility for Tape recording. Ear phone facility, Heart Beat Indicator. Small in size easy to handle . Quality product at reasonable price,export quality.